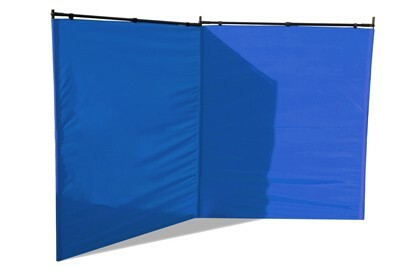 Wind Warrior is a patent-pending, portable, no-tools-needed product designed to block the wind and provide a barrier of defense that lets you enjoy outdoor activities despite the inconvenience of a windy day and also doubles as privacy screening. The Wind Warrior is made of light materials, yet is durable enough to withstand sustained wind of up to 35 MPH, and provide for season after season of repeated use. Wind Warrior is constructed of a handful of parts, and requires no fasteners or tools that can be easily misplaced - all of the adjustable mechanisms are built right into the frame.